After a leisurely hotel breakfast, we wrapped up warm and set off to the nearby U Bahn station at Hauptbahnhof from where we travelled the short distance to Willy-Brandt Plaza. From there, we transferred to a No.12 tram which had conveniently just arrived as we were approaching the tram stop. 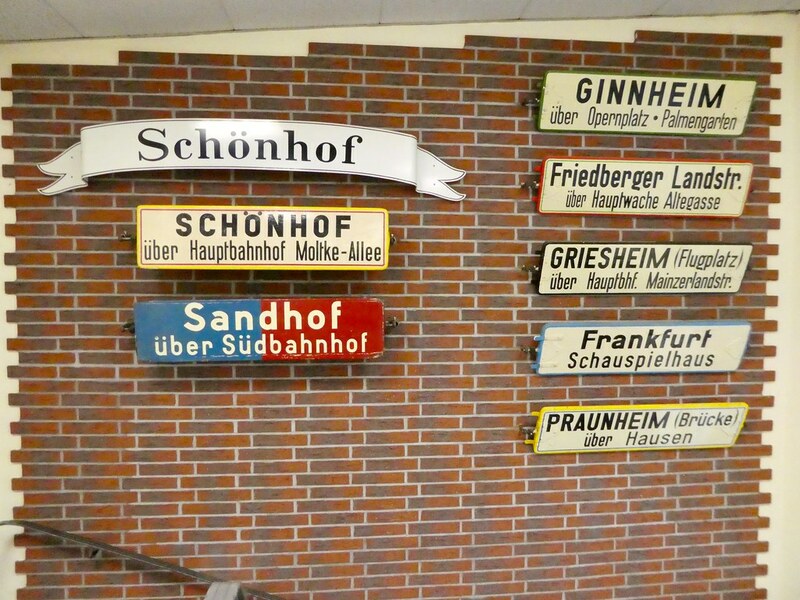 It was then a 20 minute journey to the end of the line at Rheinlandstrass / Schwanheim the home of the Frankfurt Transport Museum. Readers of my blog will already know that I have a special interest in transport museums and always like to visit them wherever I’m travelling. 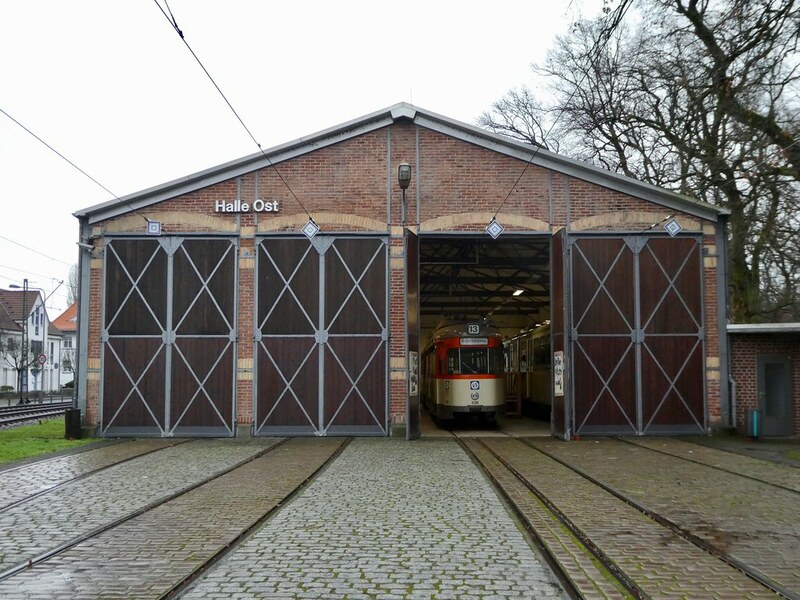 The Frankfurt Transport Museum is located in the original tram depot next to the tram stop and we received a warm and friendly welcome as we walked through the door. Admission is a modest €3 (€2 concessions), which is excellent value as there is so much to see and do. Please note though that the museum is only open on Sundays. 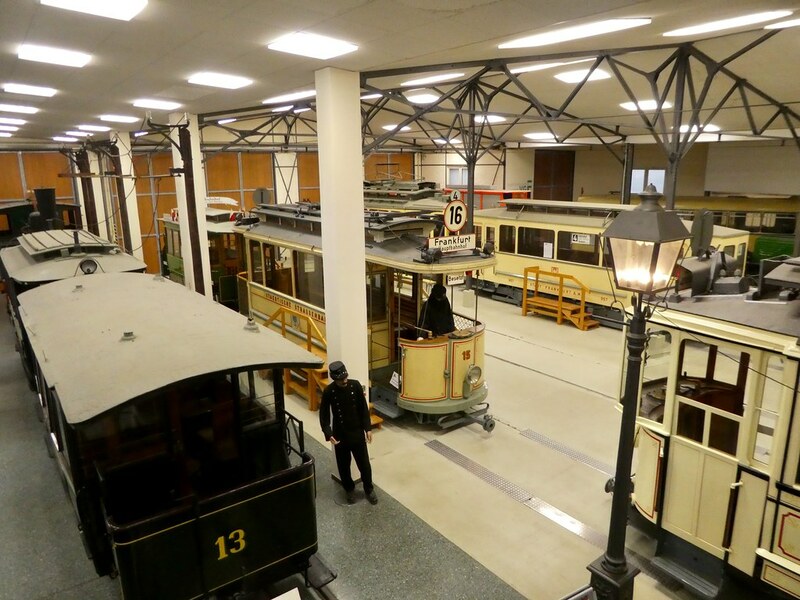 Covering a large area, the ground floor provides visitors with a visual overview of how the Frankfurt transport system has evolved over time. We viewed more than 20 lovingly restored heritage vehicles from vintage steam engines to horse drawn trams. 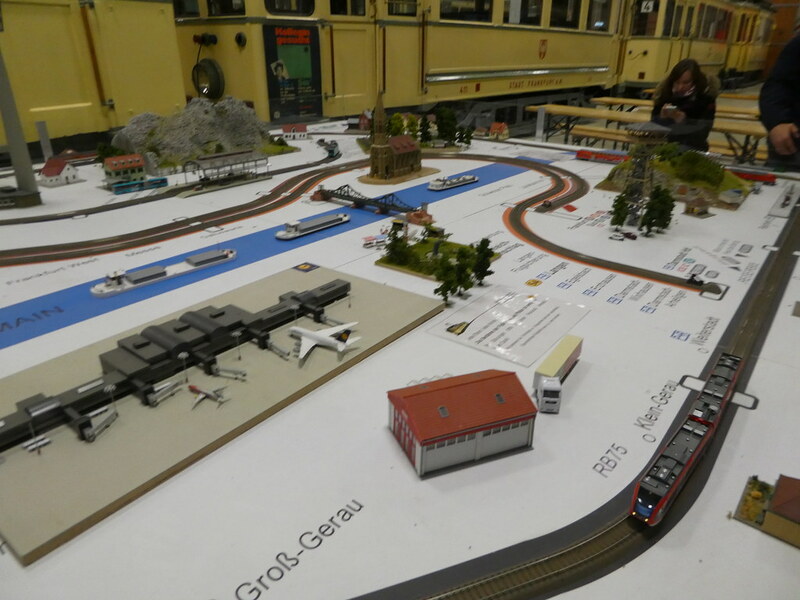 A model railway layout of Frankfurt caught our attention and it was fun to be able to control the trains ourselves by pressing buttons. Climbing the steps to the balcony level we found glass showcases containing original documents, photographs, tickets and uniforms and from this level we had a panoramic view looking down at the vehicles below. Returning downstairs and heading towards the exit we were just telling the staff how much we had enjoyed our visit when one of the enthusiastic volunteers explained that there was even more to see in a second building a short distance away of which we were unaware. 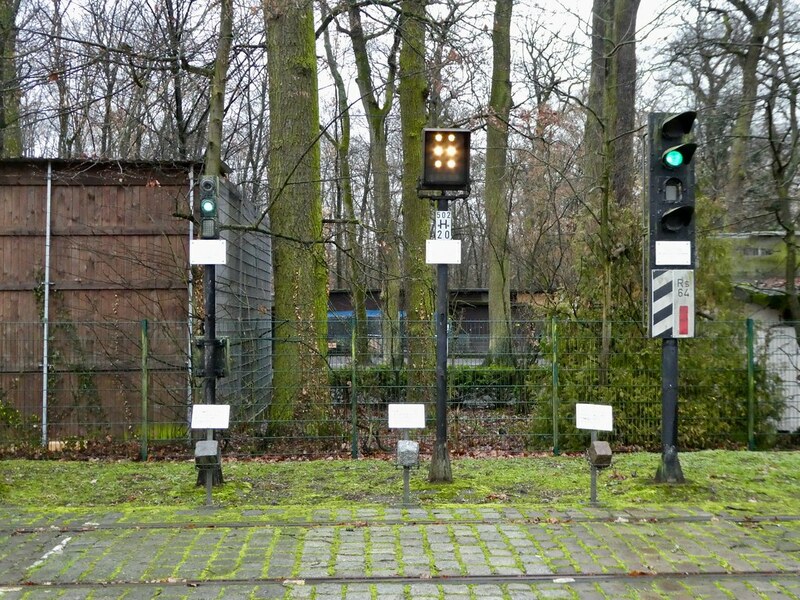 Along the way, we viewed a series of signals and an old mechanical control room which was in use until the 1980’s. This control room us now housed in an attractive out of use ornate wooden tram shelter. Arriving at the second tram shed we viewed even more trams and underground trains, the ones in here being slightly more modern than those on display in the main building. Although visitors are unable to board any of the vehicles, it is possible to climb up a few steps to strategically placed viewing platforms from where people can peer through the windows and marvel at the polished wooden interiors. There was also a snow plough on display which was pushed by a train and its only means of communication with the train driver was via a bell. If you also share an interest in transport museums then I would definitely recommend a visit to this museum as it doesn’t take very long to reach from the city centre. After a fun filled morning we boarded a tram back into town and found yet another small, cosy pub in Römerberg (old town square) for some lunch. Glancing at the menu, we both decided that it wouldn’t be fitting to leave Frankfurt without sampling some authentic Frankfurter sausages so we ordered these with tankards of local Pilsner. It had started drizzling when we returned outdoors but undeterred we put our hoods up and wandered along to the river, crossing the iron footbridge to the south bank of the Main. Turning to our right, we strolled along the tree lined embankment admiring the grand old villas overlooking the river. This district is known as Museumsufer (museum quarter) with a collection of interesting museums housed in some beautiful old buildings. From here are also to be found some splendid views of the Frankfurt skyline. 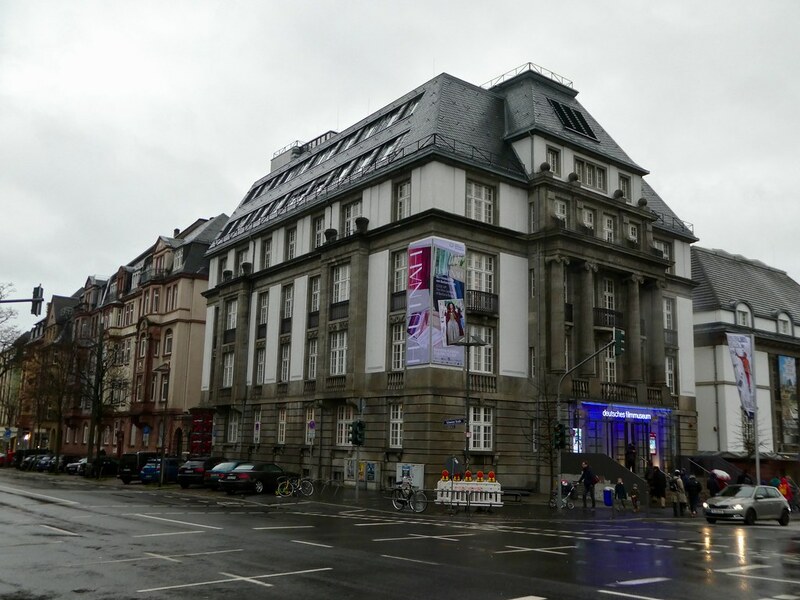 Our interests focused on two of these museums, the first being the Deutsche Film Museum just beyond the Untermainbrücke. Having visited the National Science & Media Museum in the U.K. we were interested to pay a visit here too. 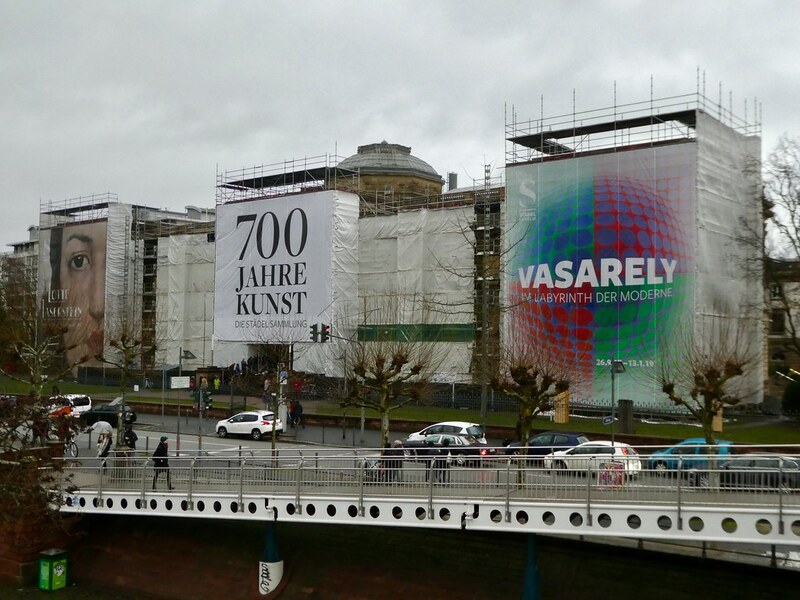 The museum is open daily (closed Monday), entrance €6 with 50% reduction for Frankfurt Card holders. 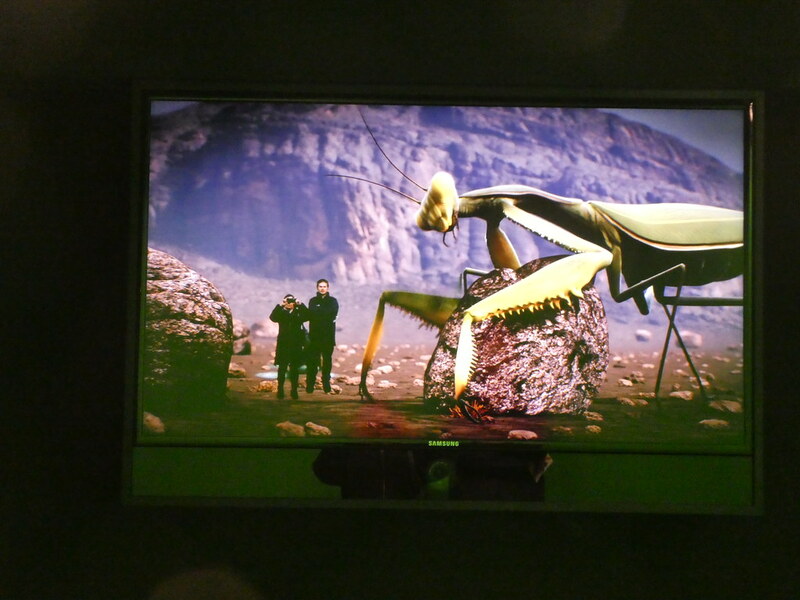 The museum showcases film from past to present and galleries demonstrate such things as moving images, projection, optical illusions and camera equipment with many hands on activities to try. In one section we were able to view ourselves on screen in differing situations including peeping downwards, in a time machine and on a sci-fi movie. 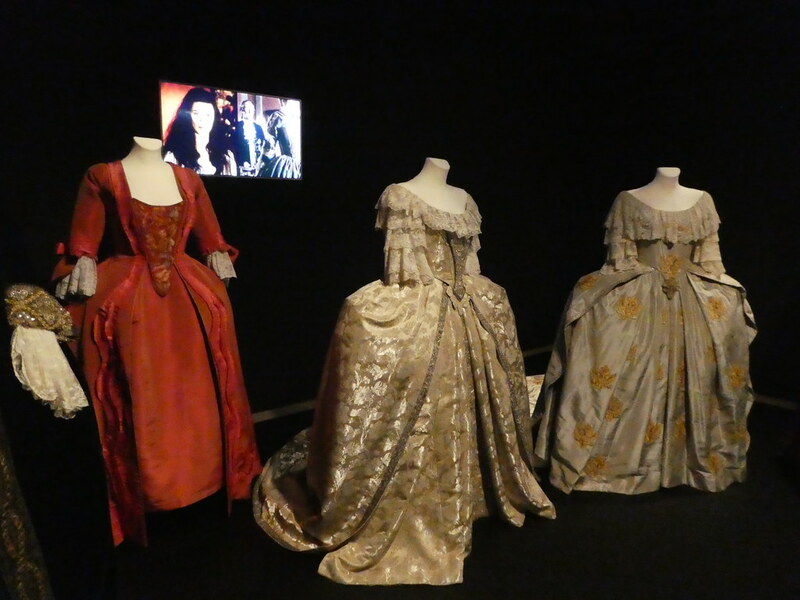 On the upper floor a temporary exhibition was taking place entitled Hauknah – The film costumes of Barbara Baum. I found this very interesting as, in addition to the actual costumes themselves, there were also sketches that had been made prior to creation. Several of the costumes were from recent films including Becoming Colette the story of the French writer, journalist and singer. 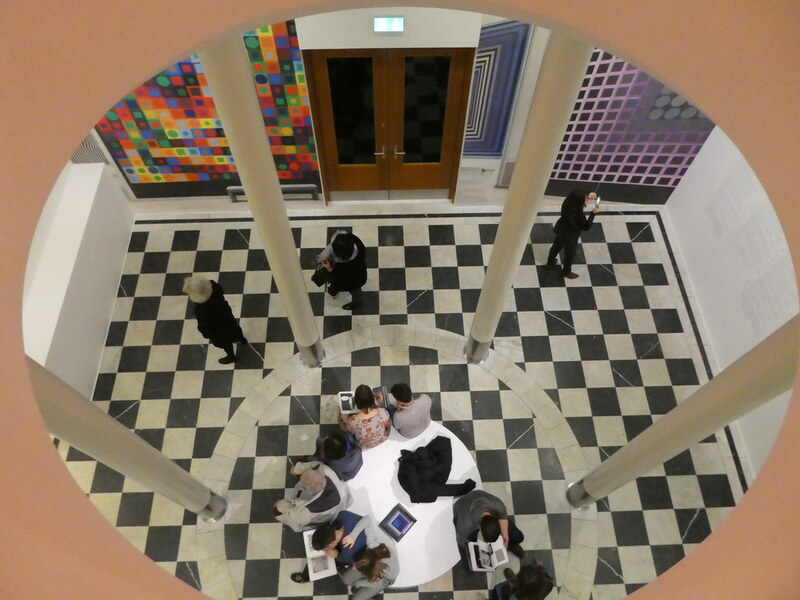 Leaving the Film Museum, our next destination was to view some art at The Städel just a few steps away. Established in 1815 by the businessman and banker Johann Friedrich Städel, the museum is Germany’s oldest museum foundation. It is open daily from 10.00-6.00 p.m. (closed Monday). 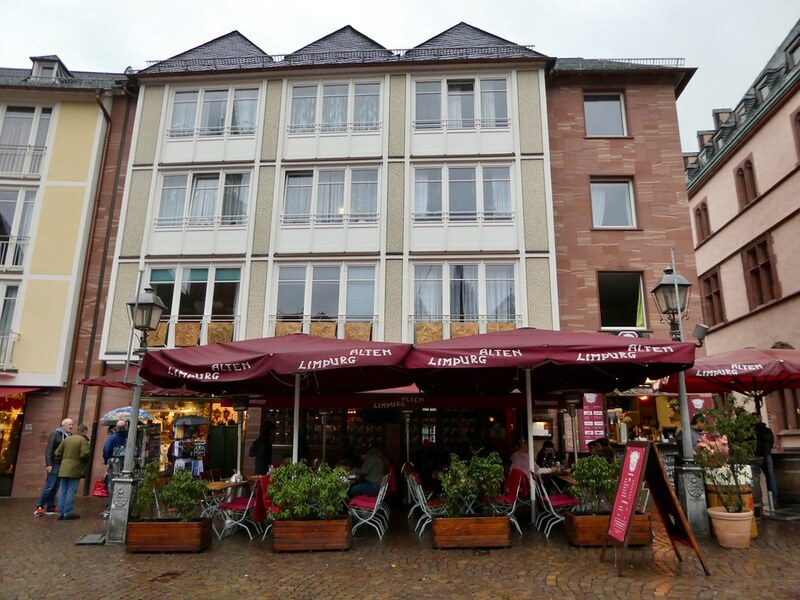 Admission €14 with a discount available for holders of the Frankfurt Card. As we were visiting over a weekend the entrance is €2 more and there was a long, snaking queue leading down the steps outside but thankfully this moved fairly quickly and we were soon indoors where it was much warmer. The museum is huge so it didn’t appear quite so busy once we were wandering around the galleries. Naturally, it would have been impossible to cover everything as the vast collection includes 700 years of European art from the 14th century to the present day with a focus on Renaissance, Baroque, early modern and contemporary art. Reading our leaflet we noted that the Städel has 3,100 paintings and 660 sculptures by such renowned artists as Monet, Picasso and Rembrandt. 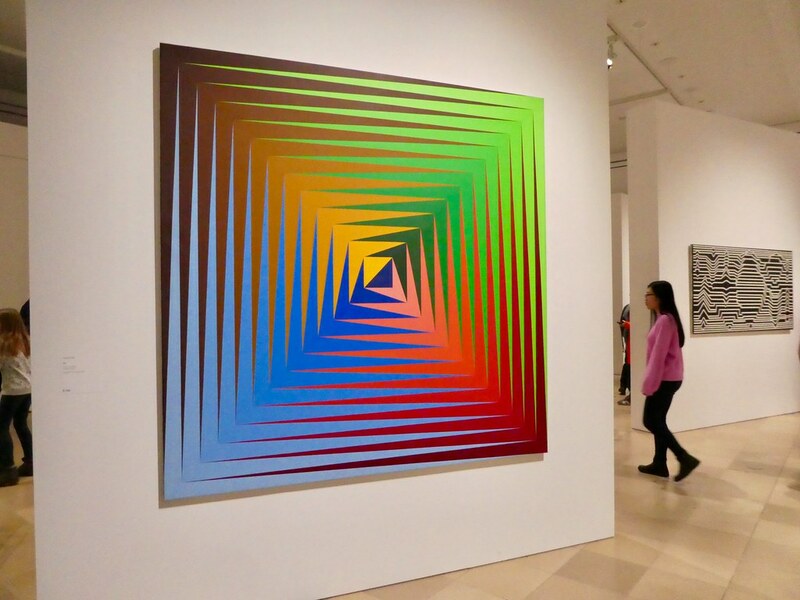 The temporary exhibition was generating a great deal of interest and was entitled ‘The Labyrinth of Modernism’ and as our tickets covered this as well, we enjoyed viewing the images, many of them giving the illusion of 3D effects. Leaving the museum, it was just a few minutes walk back to our hotel after crossing the nearby footbridge. Later in the evening we enjoyed a moonlit walk by the riverside and to the Hauptwache district where we spotted the bull and bear statues outside the German Stock Exchange. Before returning to our hotel from the Eschenheimer Tor station, we popped in a cafe for late evening coffee and cakes. Thanks Christy, the dresses in the Film. Museum were really lovely. 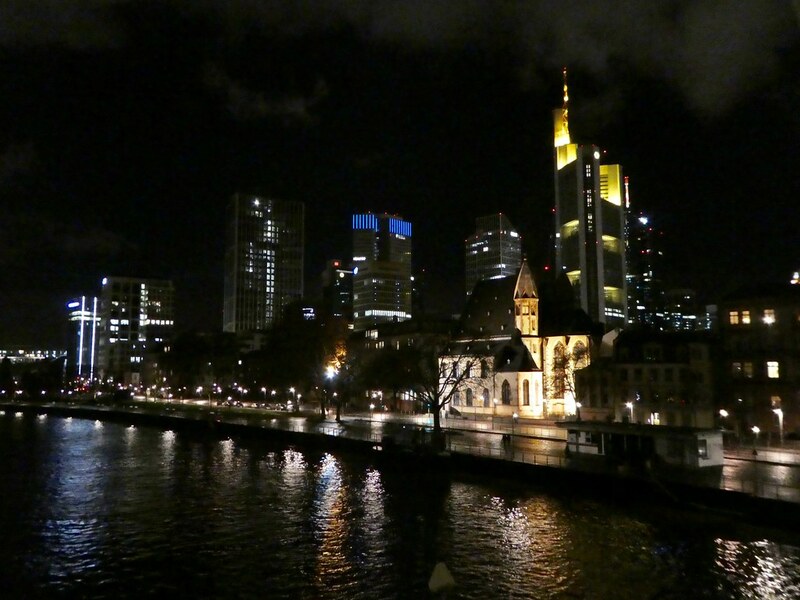 Frankfurt is on my most go list. 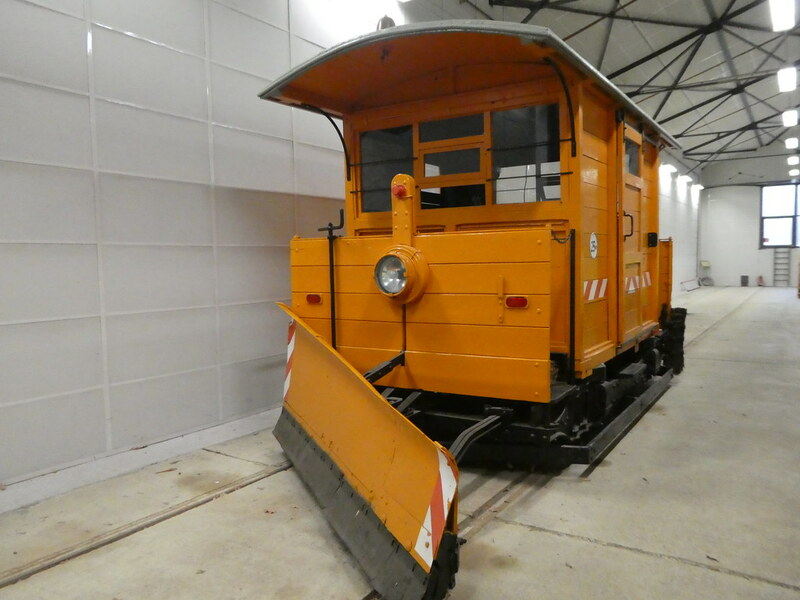 Pretty cool trains , especially the snow plow train. Thank you for taking an interest in this post. 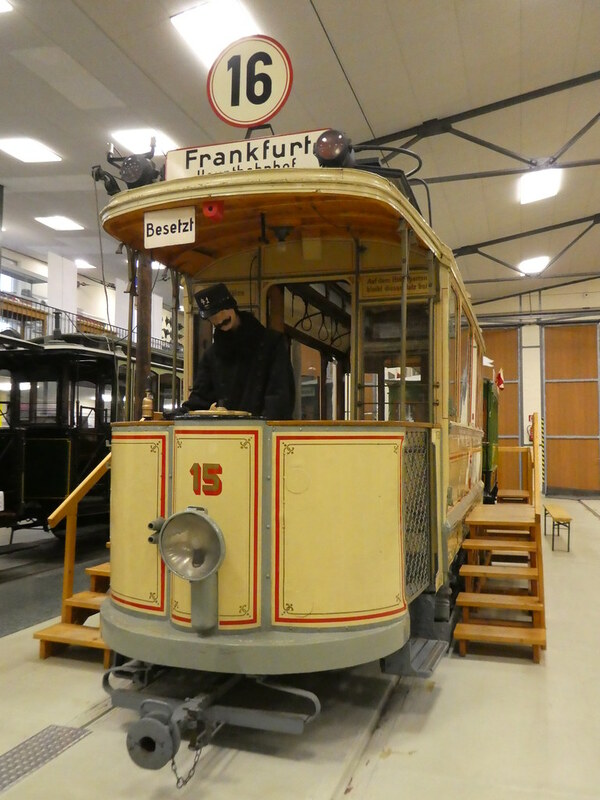 I hope you get a chance to visit them Frankfurt Transport Museum soon. Reblogged this on Our Travel Blog. I love that big old yellow tram, what a great place to explore. The transport museum was a real gem Jean. There were so many interesting vehicles for us to see. Thanks for your kind words Marcus. More reasons for me to visit Nuremberg, one of these days I’ll manage it! I love it when you are guided to that hidden part of a museum. Nice 🙂 I can’t wait for my Frankfurt trip soon! Thank you, I’m certain you will have a great time! Looking even better, the museums sound so interesting. Frankfurt is turning out surprisingly good considering its reputation as a financial centre. Thanks Jonno for your much appreciated thoughts. We found the city to be very pleasant and quite relaxed considering that it’s a major financial hub. I’ve never been but it does look an interesting city, Marion. 🙂 🙂 I’ve almost forgotten what cold feels like! 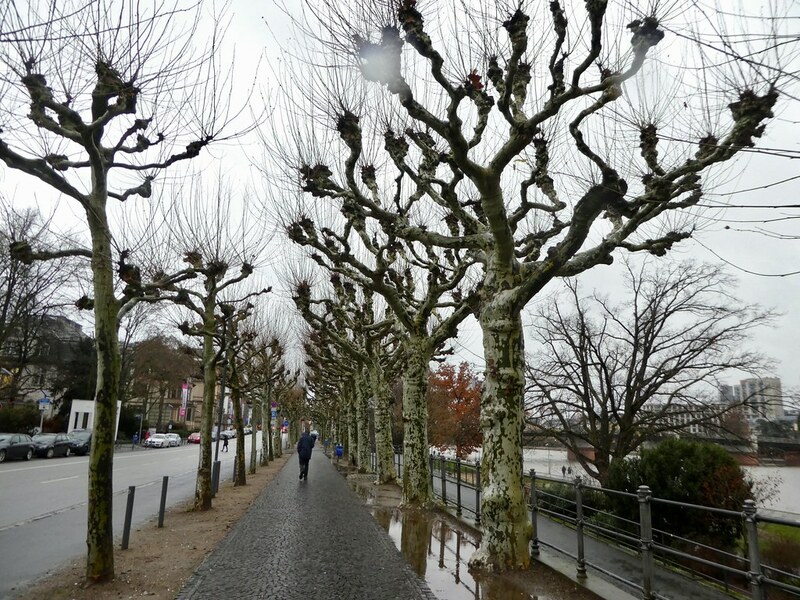 Thanks Jo, we had a very nice time exploring Frankfurt even if it was a little chilly! That’s so nice to read Ian, Frankfurt had such an interesting collection and I especially enjoyed visiting the Transport Museum. ©Love Travelling and ©Love Travelling Blog 2015-2019. Unauthorised use and/or duplication of this material and photographs without express and written permission from the author of this blog is strictly forbidden. Excerpts and links may be used, provided that full and clear credit is given to ©Love Travelling with appropriate and specific direction to the original content.